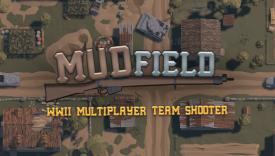 Mudfield.io | Play Mudfield.io free on iogames.space! Is World War 2 coquest top down shooter. Pick your side and soldier class and go to take some control points. You can use realistic WW2 tanks as M26 Pershing or German Panzer IV Ausf G.
There are many realistic weapons as StG44, Thompson, Kar98k, Springfield and so on. First of all, you need to pick side. Axis or Allies, after that you also pick your soldier, class. Medic, Assault, AT soldier or sniper, what ever you prefer you can play. Then you must conquest or protect control points on the map. For every second of owned control point or for every enemy death, you take enemies points. First team on the zero lose.